I was born in Louisville, Kentucky and grew up right across the river in Jeffersonville, Indiana. My childhood revolved around three things – basketball, horse racing and bourbon. Two of the three became passions of mine (As a ’76 graduate, I do still follow Purdue basketball and, begrudgingly the last few years, Purdue football). Bourbon and whiskey were part of growing up in the area. My grandfather always had a bar stocked with whiskey of all kinds. He even “sweetened” his coffee some evenings with a shot of whiskey. Many Sunday afternoons were spent on the deck in their backyard that overlooked the Ohio River, where friends would stop by for a drink and good conversation. My dad, an avid woodworker, built a beautiful bar and my parents were always hosting a Derby party, New Year’s Eve party or a group for another occasion. My parents were wonderful hosts, as were my in-laws. I think my wife, Lynn, and I learned that from our parents, and have passed that on to our kids as well. While still a Hoosier at heart, today I live in southern California after being transferred in the late 70’s. It was here I met the love of my life, Lynn, on a blind date during a polo match at Will Rogers State Park. We started having Derby parties each year and, naturally, the featured drink was a Mint Julep. This was the late 70’s and 80’s when our generation was drinking wine coolers and beer, not hard liquor. Meanwhile, we were drinking bourbon and making mint juleps, whiskey sours, and other bourbon drinks at our parties, which few understood but grew to like. Years ago, when we would go back to visit my parents in Indiana and wanted to see a distillery or horse farm, we wrote a letter or made a phone call. There was no internet or email to book a tour and it took initiative to get a visit. And there were no crowds. Once, we visited Claiborne Farms and saw Secretariat, who in 1973 became the first Triple Crown winner in 25 years. The groom brought him out of his pasture for us to see, and he was covered in mud. Lynn even fed him a peppermint from my mom’s purse. That would never happen today. An avid horse racing fan, I enjoy collecting memorabilia and following the horses – including seeing American Pharaoh win the Triple Crown at the Belmont. You will find many of my blogs around the Triple Crown racing months involve horse racing-themed releases, like the Woodford Reserve Derby bottle or the Maker’s Mark release of the American Pharaoh bottle. As bourbon began to see a renaissance 10 years ago or so, and the Bourbon Trail in Kentucky really began to grow, so did my collection and interest. I’m a proud owner of 20 & 23 year old bottles of Pappy Van Winkle, along with a number of very fine bourbons. Our bar cart at home is full and my basement is filling up. Lynn and I also love the outdoors, going to shows and plays, and exploring both where we live as well as new areas of the country. Our two kids, Taylor and Burch, live in Virginia and Texas respectively, which leads to even more travel to visit them. With that generally comes good food and new adventures. As a result, my friends prodded me to start writing, and from there grew my blog, Bourbon Bill. I hope you’ll enjoy sharing in the role bourbon plays in my family’s life – whether at Derby parties or for a celebratory drink when our two kids (grown and of legal drinking age) are home – or our bourbon adventures. 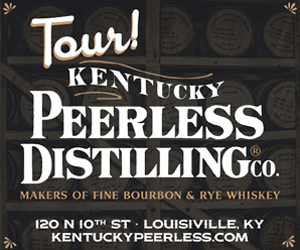 I look forward to sharing my bourbon adventures with the Whisky Chicks! Growing up right across the river from Louisville, Kentucky in Jeffersonville, Indiana, life for Bill revolved around three things – basketball, horse racing, and bourbon. Two of the three became passions of his. He currently resides in southern California with his wife, Lynn.